Travis Stewaert aka Machinedrum returns with possibly his career-defining album. Written during the early stages of this year, which saw Steward move to California and start exploring esoteric and new age sounds. This concept of sound as a healer, or as a way of expanding our mind is something he's trying to carry throughout the execution of the album. From opener "Lapis", Machinedrum immediately grabs our attention - slowly an arpeggio ascending to heaven which, apparently building towards the mother of all drops, instead fades up and off into the ether. "Morphonogene" swiftly carries the listener into some skitty, future-proof beats backed by what will become the albums ident - pitched angel vox set to a half-tempo swagger. "Angel Speak" continues the theme with euphoric stabs building and rising before a huge snare roll signifies the drop into bass heavy wobble - the post-everything production ethos coming through strong on this number while MeLo-X offers understated, classy assistance. The music throughout is scintillating, stimulating and stylish; from the mind-candy riffs of "White Crown", the ecstatic d&b finale of "Do It 4 U" (featuring an absolute stand-out vox from singer-of-the-moment D∆WN). From the smile-inducing, melodic brilliance of "Colour Communicator" to the precision and build of "Dos Puertas" featuring Rihanna collaborator Kevin Hussein, one of those albums that displays perfectly what it sounds like to be alive RIGHT NOW, without a thought of looking backwards. 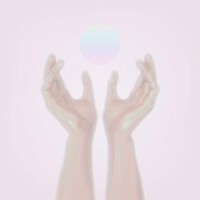 There's a plethora of collaborations: the aforementioned MeLo-X; Jesse Boykins III offers a moment of astral r&b goodness on "Celestial Levels"; Rochelle Jordan provides the lift off as Machinedrum works the rhythm flips on "Tell U". There are also contributions from Ruckazoid, Roses Gabore and SK Simeon. It's a tour de force of future musica and we love it! Recommended.